Tired of hearing LeAnn Rimes discuss her ongoing feud with husband Eddie Cibrian’s ex Brandi Glanville? Okay, we are, too—but that said, we still enjoyed seeing Rimes on Jimmy Kimmel Live Tuesday night. No, Rimes did not refrain from discussing Glanville—she did plenty of that. However, she did provide visual interest with a new hairstyle, one that we’ve never seen the singer sport before. Best described as a pompadour (of sorts), the slightly punkish/retro ‘do called to mind a look that Gwen Stefani, Pink, and most recently Miley Cyrus has rocked on the red carpet—definitely a departure for the country star, who usually wears her blond locks in a beachy, natural flow and rarely experiments with radical hairstyles. Don’t worry, though. It was clear that—unlike Cyrus—Rimes didn’t crop her hair to achieve the new style. The back of her hair was visibly rolled up and pinned. 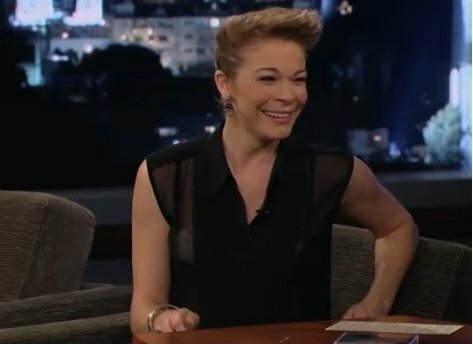 Rimes was appearing on Kimmel to promote her upcoming release, Spitfire, which will hit stores April 9. The singer has been performing songs from the album live, as well as talking about her writing process and thoughts behind them. In addition to discussing Glanville and her new music, she defended fellow vocalist Beyonce, who was accused this week of lip-syncing at the 2013 Presidential Inauguration. “I’m actually taking up for her on this one, “ Rimes said, noting that sometimes singers are asked to do so for various reasons.